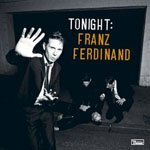 Franz Ferdinand needed a change. The Glasgow collective’s debut record glowed with energy thanks to the band’s electric mix of angular guitar jabs and lead singer Alex Kapranos’ devilish vocals. But with You Could Have It So Much Better, the light dimmed. The group failed to expand its sound enough to distinguish the record from its predecessor, and despite their best efforts, a band can’t go forever thriving on energy alone. Many describe Franz Ferdinand as an art rock band, but for the longest time, I simply didn’t hear it; to me, they’ve always played rather straightforward rock (with caveats, of course), which can be fine, unless you’re a band capable of more. And at times, we’ve seen those flashes of brilliance, but they are just flashing lights nonetheless. For Tonight, the band made a conscious effort to depart from its previous work, and, when they’re on, the move is a masterstroke. By hiding the signature guitars in a cloud of synths and keyboards, experimenting with club beats and electronica, and turning evermore sinister in both style and substance, Franz Ferdinand has transformed itself into something that, at times, sounds nothing like the band that produced pop hits like Take Me Out and This Fire. The album is dark and threatening, dripping with back-alley gloom and urban underbelly grime. To open the album, Kapranos coos like a siren leading us astray on Ulysses, whispering “Come on, let’s get high” before the track erupts into an irresistibly danceable club pop track drenched with waves of uber-heavy synths. The song projects on its listener a feeling of dirty, sinful shame – seemingly the perfect opening to a concept album that follows one long night’s chain of debauchery. In fact, Ulysses may be the most well-rounded, focused, and catchy track Franz Ferdinand has ever released. The concept is nailed on Dream Again, in which creepy organ drones and heavy bass place Kapranos as the phantom of the rock opera. In a seemingly sick and twisted way, the floating vocals shaping out a heart-warming “I live to dream again” chorus make an otherwise dark, creaking track lovely, forcing us to evaluate our own dreams and nightmares. But despite the record’s powerful opening and thematic successes, the proceeding tracks are exceedingly disparate, oscillating between flat pop tunes and overly experimental concept pieces, songs feeling out of place at every turn. Lucid Dreams breaks down to a single heavy, dark, sinister synth line that will make your head swim, but an 8-minute foray into faux-Floyd feedback doesn’t fit in an album with Bite Hard, a McCartney-esque pop ditty, or Katherine Kiss Me, the acoustic closer seemingly playing off sweet Taming of the Shrew/Kiss Me Kate literary tradition. The album is a scattershot. The individual tracks stand as some of the best the band has ever recorded, but for a concept album to be successful, they need to work together. At times, the record is right on the mark, hitting the perfect balance between energetic pop prowess and art rock experimentalism, finding an expanse on the bands former formula that suggests a brighter future. But whether the album is the triumph it believes itself to be is questionable. Does Tonight satisfy what we were all hoping for after three years between albums, along with the lofty expectations that are by definition bound to accompany a concept album/rock opera? Probably not. But, is it better than You Could Have It So Much Better? Definitely, if not only for the points on the record where Kapranos and company get it oh so right.